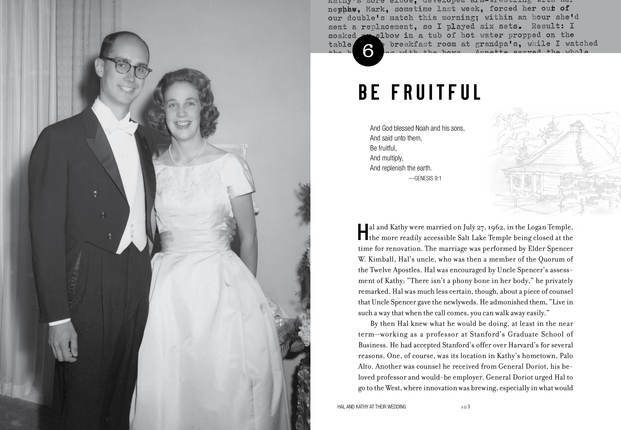 Henry Bennion Eyring was born on May 31, 1933, in Princeton, New Jersey, bearing the first name of his father, who was fast building a reputation as a brilliant scientist, and the family name of his mother, who didn't care for the name "Henry" and insisted that he be called Hal. In 1970, Hal received an impression to make a daily record of his activities. Years of journals form the backbone of this personal biography, a candid look at his walk through life with his beloved companion, Kathy. "The journal shows how a good-but-imperfect man works each day to win divine approval," write the authors, and this window into his past provides unforgettable insights about the man the Lord has shaped him to become. Readers will love these richly designed pages, filled with photographs, sketches from the pen of President Eyring himself, and scores of entries straight from his journals woven into an engaging depiction of his life's journey. President Henry B. Eyring's professional, academic, and personal experiences have all combined to make him uniquely qualified for his responsibilities as a member of the First Presidency of The Church of Jesus Christ of Latter-day Saints. His life story vividly demonstrates the power of the Lord and the example set by one who strives to follow His commands. Robert I. Eaton began serving as president of the Washington Federal Way Mission in summer 2013. Prior to that, he was a professor of religious education at Brigham Young University-Idaho. He is a graduate of BYU and of Stanford Law School. He and his wife, Diane, are the parents of four children. Henry J. Eyring graduated from Brigham Young University, earning a bachelor's degree in geology and graduate degrees in business administration and law. He is the advancement vice president of BYU-Idaho and has served as director of the BYU MBA program. He also served as president of the Japan Tokyo North Mission. He and his wife, Kelly, are the parents of five children. I read the book in 17 hours while sick in bed. It is enthralling, warm tone that draws you in so you feel like you have personal insight into Elder Eyrings life, honest yet not critical, insight in the preparation of a modern day Apostle and a touching story of a devoted husband and father. Every second page has a quote from the daily diary Elder Eyring kept and this adds a warm human touch to the story. His devotion to the Lord, family and people is remarkable. My testimony of how the Lord works and prepares an Apostle was increased as was my respect for those who lead our church. I highly recommend the book to everyone - This book is one of the best journeys of obedience and devotion to the Lord I have ever read. I am always impressed with the magnitude of greatness that the leaders of the Church of Jesus Christ of Latter-Day Saints have. But what an example of faith and fortitude they show for us. From the way his parents raised him to his schooling and military service to being married and raising his own children to being a prominent leader in science and church. Filled with pages of photographs, journal entries, quotes and stories! I knew he kept a journal, but did you know he adds drawings to the margins..how FUN! ABOUT AN AMAZING, COMPASSIONATE MAN! Beautifully-written take on a truly humble man. I really enjoyed this beautifully written glimpse into the life of President Henry B. Eyring, first counselor in The First Presidency of The Church of Jesus Christ of Latter-day Saints. Full of quotes from Hal's numerous journals and talks, the book gives the reader a look at the man he has become and some of the experiences and choices that made him that way. For such a long book (over 500 pages) the book is very readable and held my interest all the way through. I especially liked the design which included journal entries as well as side quotes, photographs, and drawings right from Elder Eyring's journals. I felt like a gained a deeper appreciation for the man. 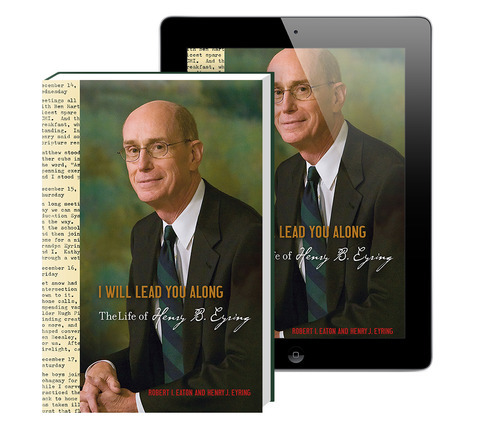 I knew as soon as I opened to the introduction of I Will Lead You Along: The Life of Henry B. Eyring I knew I was going to like it. It opens with one of my favorite scriptures, Doctrine & Covenants 78:17-18, from which the title of this book is taken. I was impressed by his introspective nature, and reading about how he so often pondered on what he perceived as his weaknesses and what he could do to improve himself, I find myself pondering on similar topics and looking at how might improve myself and be more fit and more worthy to serve. For me, this was one of those books that I toted around with me and read in every spare moment. There more I read, the more I wanted to read and found myself more and more engrossed as I got deeper into his story. I have always felt the best measure of a book is if it leaves you changed for the better, and it makes you think and reflect on your life in some way. This book definitely did all that for me. Of all the biographies I have read of LDS leaders (and there have been quite a few), I think this one is my favorite. There is just something about Hal Eyring and his life that just drew me in and made me want to spend more time with him. I am sure now I will be listening even more closely to his next conference talks. I love to learn about these men who we seem to think of as "larger than life", only to find that they are "real" people with real families and lives. It's inspiring to see the way that their lives are like our own and to allow stories from his own life to influence our own. This is the first biography I have ever read, and thanks to the amazing read it was, likely not the last. This 560 page inspirational memoir outlines the life of Henry B. Eyring, who is called simply " Hal" throughout the book. It's full of sketches form his personal journal, family photographs, quotes from those who know him and typewritten excerpts in Hal's own words. The multi- media approach to outlining Elder Eyring's life was not the only draw however. It's the stories of a man who is ever striving to seek the answers to his prayers, to serve, and to be an amazing father to his children. Hal and his father were both brilliant scientists who left a huge mark on the world around them. I learned so many interesting things about Hal that I didn't know before. As a boy Hal was befriended and protected by a member of the African American Hawks gang, teenager Tommy Homes, who protected Hal and became a guardian against bullying. Elder Eyring served his mission after receiving his Bachelor's degree as a District missionary in the Air Force. Spencer W. Kimball was Hal's uncle and often gave him inspirational advice. He owned a red VW beetle from his father as an MBA graduation present. He drove it at Stanford, but it was sold without Hal's knowledge, by his father-in-law while he was out of town. The replacement car was a late-model Ford Thunderbird with rear "suicide doors" hinged at the back rather than the front. As I carried I Will Lead You Along with me, it drew a lot of attention wherever I went. People often asked to look through it. 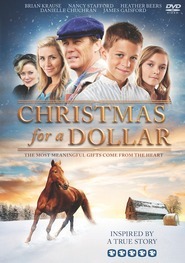 I highly recommend it because of the example Hal's life set and the deep lessons that are embedded about seeking the Lord's guidance in all things and going where he want you to go. An absolutely beautiful and enlightening read. This is a beautiful book. I love the way that it is formatted. There are pictures, and drawings by Henry B Eyring himself, as well as bits and pieces from his private journals with his personal thoughts. I loved the way it reads almost like a story, a lot of times for me biographies are really dry, boring and hard to get through, not so with this one. The way it is written is engaging and draws you right into the life of President Henry B Eyring and his family. This is an inspirational and amazing book that you won't want to miss! I didn't know much about Henry B. Eyring, other than the obvious, that he is the First Counselor in the First Presidency of The Church of Jesus Christ of Latter-day Saints. Watching him speak at General Conference this year I realize that, since he isn't one of my "favorite" speakers, I have, sadly, not paid much attention to his talks. I realized that I didn't know a thing about him. So, since I was pretty clueless I was excited to read this book about his life and after spending days in its pages I feel like I've gotten to know President Eyring a lot better! He was already balding when he got married. He is incredibly smart, I'm not joking when I say he is pretty much a rocket scientist. He can draw/sketch and watercolor paint really, really well. He is the nephew of the late Spencer W. Kimball. He went by the nickname "Hal" because his mother disliked the name Henry. He served 2 years in the Air Force. He was president of Ricks College (now BYU Idaho). He has kept a journal his whole life! The layout of this book is really interesting, not what I expected. Each chapter focuses on a different part of President Eyrings life, punctuated with his own Journal entries and and his sketches throughout! Since the 1970s he included these little sketches in his journal entries. He said, "My sketches are not lovely, but the work is interesting to my family." I think they are great! At the end of the year he takes his journal, photocopies it, and gives it to his family members. Isn't that a wonderful idea? There are also just tons of pictures in this book! 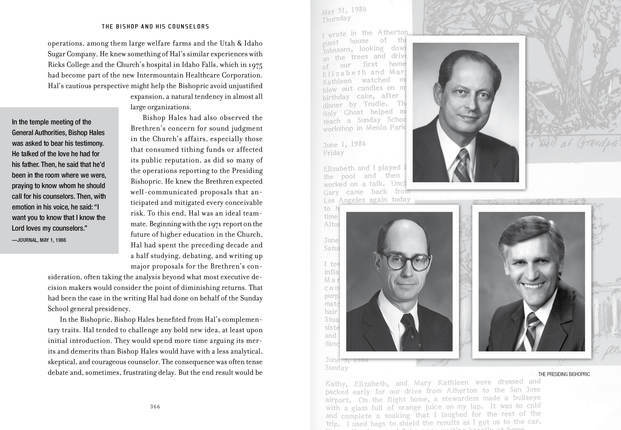 President Eyring has a unique speaking style, and that style is reflected in this book. It reads just like Pres Eyring speaks. As such, a lot of tears are shed throughout, and Pres Eyring makes sure the reader knows those tearful moments. Does it always make sense why there are tears? No. Most of the time, I wasn't able to make that connection. But, it was still a very powerful read. President Eyring has been the most influential general authority to me in my life. So much so, that I adopted his speaking style many years ago. Yes, I make sure that I cry every time I speak, teach, or bear my testimony. The quivering lips, the crackled voice, the tears, the whole works. It's about selling the message. And President Eyring definitely sells with me. When this book arrived I thought, That is a huge book! I wasn't sure I'd be able to fit in the time to read it all, but the story of President Eyring's life was so engrossing to me I just kept reading (even when I should have been sleeping or doing dishes). I especially loved every word written about his sweetheart, Kathy. It was beautiful and inspiring to have insight into their marriage and parenting. I cried when I read the last chapter. President Henry B. Eyring is amazing, a spiritual giant, but you can feel as you read his book that he is truly caring, humble, and loving. Stunning in style and content! Absolute Must Read! This ebook is like an early Christmas present! 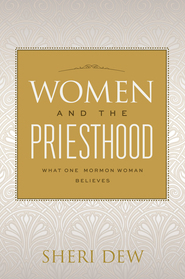 What a beautiful and stunning ebook Deseret Book has produced – the layout and presentation is stunning, not something I typically expect from an ebook. Unlike many ebooks, you are not missing anything with this one, including President Eyring's sketches. The style and format actually match the substance of the written content. You have set a new standard of quality and presentation of ebooks with President Eyring’s biography. 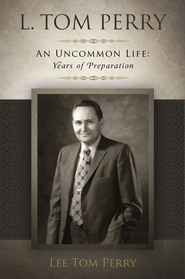 And the biography itself may well set a new standard in LDS biography, rivaling that of President Kimball's 1978 biography. 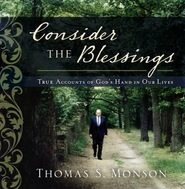 This is easily in my top 5 of the best LDS biographies ever written! Different from any biography I've ever seen! 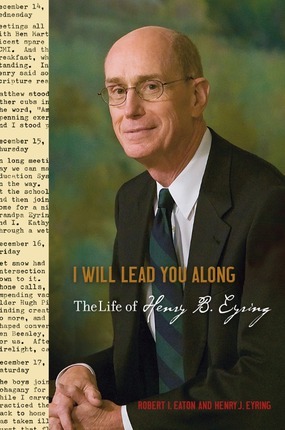 I have always loved President Henry B. Eyring’s conference talks, so I expected to enjoy his biography. But I could never have envisioned how beautiful and unusual the book would be. I particularly love the journal entries and the sketches from the margins of his journals. I had no idea he was such an artist. And the photos are just priceless! The design pulled me in, but it was the story that kept me there. It is primarily the story of a family man, and the influence of his parents and later of his wife is clearly evident throughout. Because so much of it is delivered in his own words, via his journals and other writings, it feels very personal and firsthand. “The journal shows how a good-but-imperfect man works each day to win divine approval,” write the authors, and the picture that emerges thanks to the combined skills of Robert I. Eaton and President Eyring’s son Henry is just that: an authentic and spiritually affirming account. I will always treasure the things I learned from Hal Eyring’s brilliant work in business, education, and Church service. (And I KNOW it feels presumptuous to call him “Hal,” but that is the only way he is referred to throughout the biography. His mother didn’t care for the name “Henry” and insisted on “Hal” instead. Just one of the endearing facts in this book.) He brought to his call as an Apostle exactly the skills and experience and temperament that were needed in the information age—and his biography shows us how those skills were developed and how that temperament was forged in the furnace of his experiences. It’s a great story, delivered in a gorgeous package. A must-read!